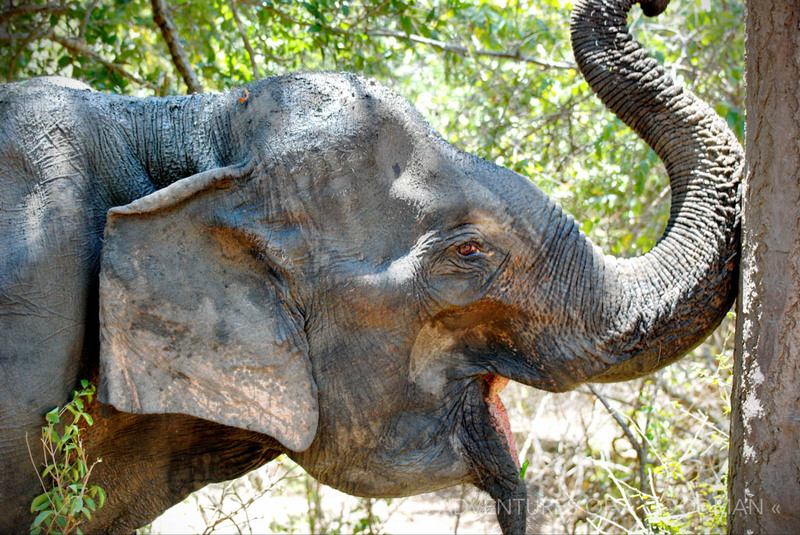 Located on the Southeast corner of Sri Lanka, Yala National Park is supposedly the best place in the country to see leopards, elephants and scores of other animals in their natural habitat. So, after our time in Ella we headed to Tissamaharama (Tissa) and booked an overpriced safari with high hopes. The fun began at 6:30am when our rusty bucket-of-bolts jeep with no shocks and barely padded seats that dug metal into our backs with every bump departed our hotel. 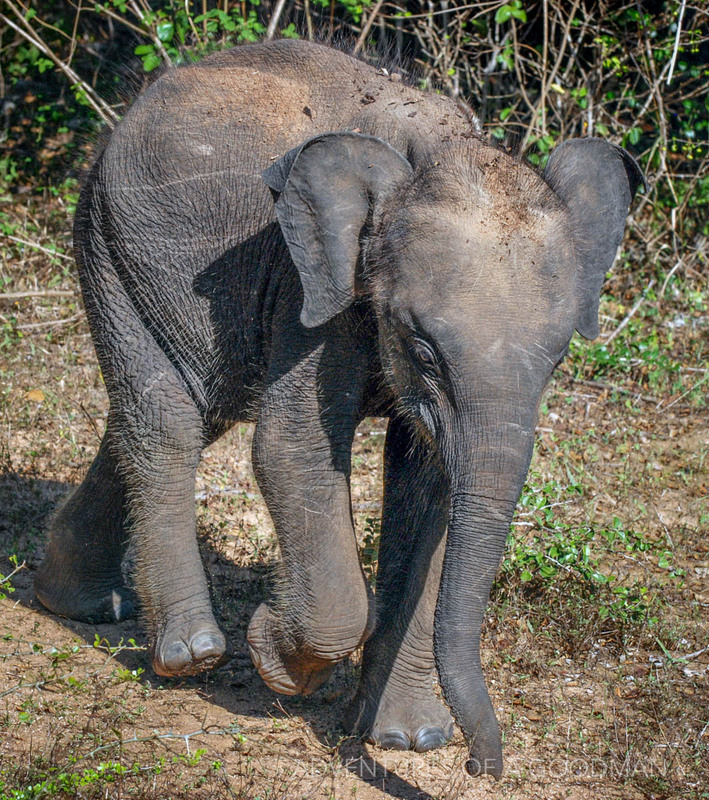 “The early morning is the best time to see animals,” our driver said as he sped over every single hole in the road, racing the 25 miles from Tissa to Yala. When we arrived a tracker hopped into the jeep to act as our eyes and ears for finding animals. It took a little while, but soon we were parked staring face to face with a beautiful male leopard. At one point he actually came within two feet of our jeep before walking back into the forest to take a rest on a sunny rock. By this time, three other jeeps had stopped alongside us so we moved on to give them time in our prime viewing spots. At this point our tracker said, let’s go try and find some bears, We drove for about five minutes and then wham! Bears! We stopped the jeep again and watched a pair of babies have a drink from the other side of a pond. Also watching were four other jeeps who stopped after seeing us parked. Filled with expensive looking camera and video equipment, they were filming some sort of nature documentary. Guess we found a good spot for a safari! Thirst quenched, the bears walked away so we went back to the leopard area where our friend was still sunbathing. The other jeeps began to drive away and no sooner than there was quiet again the leopard got up, walked right across the road in front of us and to the other side where a female leopard was waiting in the forest. The two of them lay down facing each other and began to roar at each other and began the mating ritual. We sat there in the jeep, silent, snapping photos and waiting to see two leopards do it. Our tracker was pretty sure they would begin to mate as well until the roar of the other jeeps returning completely killed the mood for them. Frustrated at the voyeurs, they headed further into the forest away from our prying eyes to make little leopard babies…or at least that’s what I imagine happened…all we saw was them get up and walk away. Our breakfast stop was on the beach where the 2004 tsunami had hit and killed 46 tourists and locals staying at a cabana and eating at a restaurant. The cabana’s foundation still stood and in front of it was a touching artistic metal wave memorial. Stumps and uprooted trees lined still the beach, even after four years. Still, despite the tragedy that hit there, the area was tranquil, had a wonderful view and was a great place for quick stop. Also on the beach was a crew of roughly ten prisoners doing manual labor in the fields surrounding the beach. Along with a couple of armed guards, they drove back in forth in a tractor between where they were pulling up roots and cleaning the beach and where they were dumping the rubbish. On the hill above was their prisoner bus, ready to take them back to jail after their day of hard work in the sun that was probably a reward for good behavior. Could you imagine seeing something like that back in the USA? As our day continued so did the parade of animals. The ones we saw most frequently were water buffalo, spotted deer, alligators and elephants, though we also saw at least one wild boar, jackal, wild squirrel, mongoose and iguana. We also saw thousands of birds including pelican, king fisher, bee eater, hornbill, eagle, owl and the jungle fowl, which is Sri Lanka’s national bird. Other than the leopard, my favorite animal to watch was the elephant…and we saw tons! In the morning we watched one eat for five minutes right in front of our jeep. Later, a family crossed right in front of us. We really wanted to get a good view (and good pics) of the baby, but like the mother expertly walked across the road with her body blocking the child from us. There were also more elephants from afar and seeing them never got old, even as our count ran into the teens. Seriously? A 3.5 Hour Break? Animals do not like to move around in the midday heat, which causes a problem for any full day safari. However, our safari organizer neglected to mention this fact when we were deciding between half and full day and hearing about the schedules. We actually didn’t realize that it would be an issue until noon, when our jeep pulled back into our breakfast spot and told us that the safari would resume at 3:30. While we understand that you can’t force nature, we were not happy about the unannounced massive break. Had we been forewarned, we could have brought bathing suits, blankets, things to write with or books. Instead, after eating lunch and exhausting the two card games we know we were bored and ready to go. Knowing exactly what his reaction and response would be, Carrie still tried calling the organizer to see if we could end the tour early. Our argument was valid, but all he said was “you saw what you wanted to see in the morning and now you’re done.” This was NOT the case, but he didn’t get that and his only suggestion was to start the tour again now. “We don’t want to just drive around in the uncomfortable jeep looking for animals that aren’t there,” Carrie said. I think the organizer was genuinely surprised that we would not want to just hang out at a beautiful beach at a national park and didn’t get the point that he just needs to tell his customers these things in advance. It didn’t help that we spent a lot of money on the safari and felt we weren’t getting what we paid for. In the end we had no choice but to just chill, moving from spot to spot as the sun began creeping around the trees we were laying under. Ants crawled on us, twigs poked our backs and the prisoners passed us every now and then. When 3:15 hit we finally got back in the jeep for the last two hours of animal spotting (more elephants and another leopard were the highlights). I think we may be the only people who got a full day tour. When our driver told another driver we were full day the other one seemed shocked. While frustrated during our long break, we deemed it the stupidest nature safari ever. It really wasn’t, but laughing at that helped pass the time. When our jeep’s engine began to overheat the problem was solved by the driver putting water in that he scooped from an alligator-infested lake. Our tracker wore a collared shirt with slacks. Everyone else’s was dressed casually. We really wanted a tracker who had been doing the job for decades, but ours had just started three years earlier and just did it as a job. Part of the tracker training course involved tracking and catching a snake. On a safari you pay all this money to see animals in their native environment, but at its core it’s just a glorified zoo without the cages. For the animals, the jeeps are just another strange animal that they don’t like to go near.